Pastor Rasma Caune (Tsau-nay) grew up in a Latvian household with 3 siblings, her maternal grandmother and her parents. Active in church, Pastor Rasma enjoyed serving in many capacities including teacher, youth group leader, area women’s auxiliary chair, conference planner and council member. After graduating from Scarborough College with a degree in German language and literature, Pastor Rasma taught German, French and E.S.L. in several Scarborough high schools. A leave of absence from teaching to test the waters at Toronto School of Theology, registered as a Waterloo Lutheran Seminary student convinced Pastor Rasma that she had found her calling. She graduated and was ordained on June 11, 1993. Pastor Rasma began her ministry as Interim Pastor at Redeemer Lutheran Church in Toronto and received a call to Good Shepherd, North York a month later. 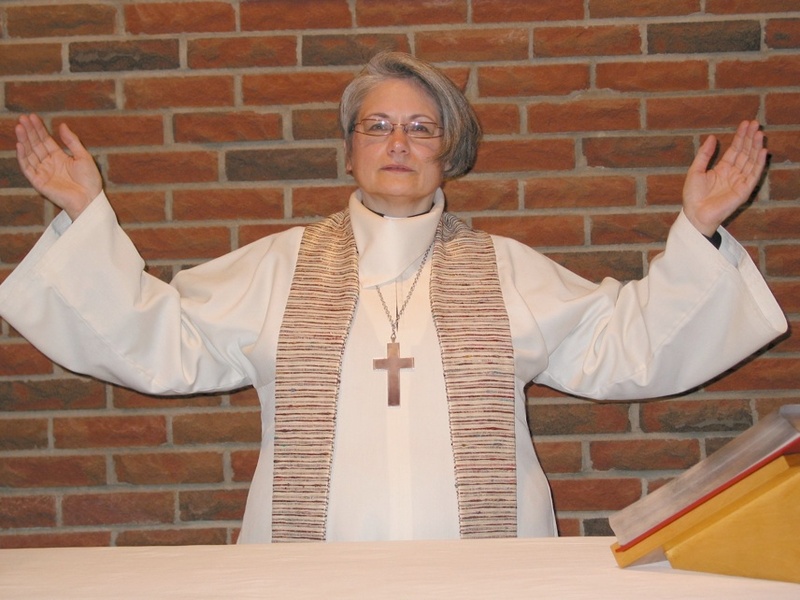 She served Trinity Evangelical Lutheran Latvian Church in Montreal for six years, leading worship on special occasions in French, English and Latvian. Six years at Transfiguration Lutheran Church on the mountain in Hamilton proceeded and following this, Pastor Rasma returned to University and graduated this year with a degree in counseling. We welcome Pastor Rasma and her special gifts to Epiphany and pray that her time with us is blessed. Who would ever have thought that I would become a pastor let alone preaching in so many languages? I loved the church as a child – the music, the liturgy and my Sunday school teacher. After a difficult year of teaching, I needed spiritual renewal and began a summer program at the Theological Institute run by the Evangelical Lutheran Church Abroad. Again after that a parishioner in my home congregation asked whether I wanted to become a deaconess and I responded, “No, I just wanted to be spiritually refreshed and I was. I’ll be going back again next summer.” As it turned out, I went back every summer and graduated twice. It was after the third summer that someone from the group asked me out of the blue, “You’re going to become a pastor aren’t you? There’s something about you.” I began to cry because she had identified my struggle. From a desire for spiritual renewal, I had been captured by the Spirit itself and by a relentless God. He kept calling me in so many ways, until I finally said my “yes”. I feared my parents’ reaction and was surprised that they trusted that I was making the right decision and promised their support and blessing. I took a leave of absence from teaching to test out the waters at Toronto School of Theology, though registered as a Waterloo Lutheran Seminary student. It only took a week or two and I knew that this was the place for me. It was challenging especially at worship, since my God had always spoken to me in Latvian and that is how I understood him and how I answered his call. I didn’t know how to pray in English, and certainly didn’t understand theological terminology and sat reading scripts with my “handbook of biblical criticism”: Christology, Eschatology, Soteriology and Grace? Needless to say I graduated and was ordained on June 11, 1993 along with 3 other second career people. I was supposed to go to England to serve Latvian parishes, but this fell through. I had been ordained into both the Eastern Synod of the ELCIC and LELBAL, the governing body of the Latvian Lutheran church. I began as interim at Redeemer Lutheran Church in Toronto and received a call to Good Shepherd, North York a month later. Montreal followed and I became pastor of Trinity Evangelical Lutheran Latvian Church, serving the Latvian community for six years, but also leading worship on special occasions simultaneously in French, English and Latvian. But what I had never imagined was that I would have the opportunity to use my German when replacing colleagues on vacation. Hamilton followed and I served Transfiguration Lutheran Church on the mountain for another six years before going back to school and reinventing myself as pastoral counsellor. I will finally graduate this Friday!! But God kept calling me back to use my newest skills in Epiphany Evangelical Lutheran Church. Reflecting back to my under-graduate years at Scarborough College, when someone asked, “So what are you going to do with a degree in German language and literature?” I had replied, “I don’t know, but I’m sure I’ll put it to use.” I put it to use as a language teacher in Scarborough along with French and ESL and preached in four languages always having to challenge myself to understand God and church terminology in a different way. Did “grace” mean the same as “želastiba” or “Gnade” or “grâce”?